Body language includes more than just the slouch-factor or where you put your hands. In fact, it includes facial expressions, proximity to others, body position, habits, eye gestures, how we touch ourselves and others, how we interact with what we touch (i.e., fiddling), and even breathing. But body language — specifically our control over it — can also be quite conscious. By identifying the habits you have that don't serve you well and adopting new habits that increase the engagement factor with other people, you can consciously improve your body language — and hence your communication skills. At first some of the techniques in this article might seem awkward or forced, but most often it's only you who feels that way, since you're changing an ingrained habit. Keep it up, and you'll be naturally socializing like a star in no time. Before we get into the specific methods of improving your body language, remember that no one gesture is universal. Although crossed arms can signal a communication blockage, it could also be necessary for warmth or simply a comfortable way to hold your arms. Rubbing your eyes could signify frustration, or it could just mean you're tired or have an itch. Try not to read into body language (yours or others') too much or too literally. Culture also plays a part in body language. Some cultures respect personal space more than others, so proximity guidelines would be different depending on who you are dealing with. Other cultures view eye contact as a threat and lack of respect, and not the sign of confidence that many Western cultures view it as. Here are 16 ways to understand and improve your own body language. The first step to body language improvement is awareness. Start to pay attention to everything you do, and when you do it. The other day, I noticed I play with my earring when talking to certain people or about certain topics; with that realization I can better understand why I do it and what it means. Awareness is half the battle. Look at other people — especially people you admire. How do they hold themselves? What can you learn from them? If you are sitting or standing opposite somebody, mirror their body positions, match their tone, and carry the same pace of conversation. Don't do it in an obvious or unnatural fashion. Even subtle mirroring can create a synergy and connection, and after a while you'll both be doing it naturally — you won't even know who is following who! Many people find crossing arms or legs comfortable, so it's no use to say you can't do it. If you want to cross your legs, that's okay; just be aware of the direction your cross them in, and make sure you cross towards your conversation partner. Beware: crossing your legs in a "figure four" fashion with your ankle resting on your knee can be seen as being stubborn or arrogant. Also, be aware of other ways of creating crosses with your body; women often grab their opposite shoulder or elbow, or people hold a drink on the table using the opposite hand: these are signs of a lack of confidence or closing your body (and mind) to the conversation. Eyes are windows to the soul, and what you do with them communicates a lot. Be sensitive to cultures that eschew eye contact with elders or strangers; otherwise don't be afraid to look somebody in the eye. Not only will you say a lot by doing so, but you might also learn a lot. Holding your shoulders by your ears is a sign of tension, and stands to put your conversation partner on edge as well. Although sitting ram-rod straight might be a forced exaggeration, make sure you're not slouching. Your back — and social life — will benefit. Have you ever had a conversation that you're both really enthusiastic about? You'll probably notice you both are lively, and leaning in towards each other. I'm a sucker for playing with my drink, or straw, an earring, or a bottle cap — with what I affectionately refer to as a "tactile fixation." But it can be a sign of nervousness and, at the very least, a distraction for others. Also watch out for touching your face or running your hands through your hair. Although a slight tilt of your head can indicate interest, too much of a head tilt (women are the main culprits for this) indicates submissiveness. Although intonation isn't quite body language, it warrants mentioning since it's part of the subconscious messages we communicate. Ending your sentences like questions indicates a lack of confidence in what you're saying, which does nothing to instill others' confidence in you. Don't squeeze the life out of your new acquaintance, but a nice firm handshake feels good. I tend to try to match my acquaintance's handshake (like mirroring) — except for wet fishes. I just can't do it. Conversely, holding your hands in your pockets might be comfortable, but can also indicate boredom or over-confidence. Unless you're star-crossed lovers gazing into one another's eyes, sitting directly opposite somebody indicates confrontation. It's even worse with a table or desk in between you, which creates a barrier. Instead, try to sit at a 45 degree angle. This provides comfort, space, and still allows you to mirror and engage. Now that you're probably hyper-aware of everything you do and don't do, take a deep breath and relax. Adjusting your body language might feel unnatural at first, so don't force it too much. With a dose of awareness and applying these techniques gently over time, you'll communicate everything you want to with your words as well as your body. Found this article useful? Pin it! Hey that is the guy from PhotoXtremist! For number 5 (eye contact), this book is very interesting: The Power of Eye Contact: Your Secret for Success in Business, Love, and Life by Michael Ellsberg. I've heard thsese topics in the Conference at Montreal last July. This is absolutely usefull, for all moments! I recently video taped myself doing a couple of introductions/interviews. I couldn't believe some of the habitual body language things I was doing and had no idea I even did those things so often. I also used filler words when I spoke. Paying attention is what I do now to minimize the distracting actions. I think body language is actually even more important than what you say. The way you carry yourself and interact with others says a lot about the person you are, and how you view the world. Good list, and a lot of these are helpful during situations like job interviews and networking. What most people do not know is that your body language tells everything about you. The 16 ways to improve body language were all good. 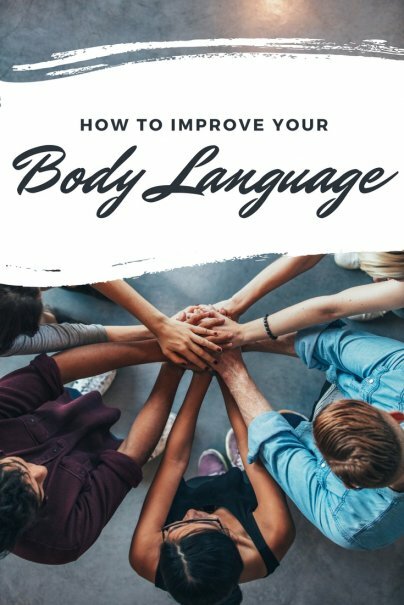 I make sure that I am always aware of how I am portrayed to others and so I make sure that I follow some of the ways you listed on how to improve body language on a daily basis.